I have been working with Solar return charts and profections for many years now. I take the ruler of the profected ASC as “Lord of the Year” and look at its position, condition and configuration in the Solar Return chart. When angular the native is more of a driving force behind the events that will take place that year, when cadent things happen through the outside impetus. I have found that the returning of angles in the solar return chart to the same signs as in the natal chart indicate a significant years. Here is the story of a Solar Return. 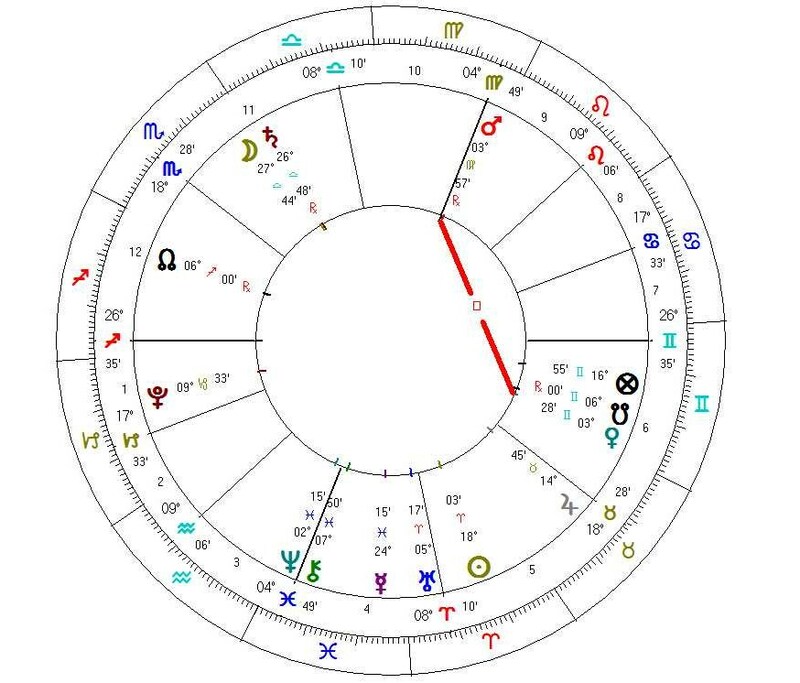 My son was visiting over the Christmas holidays and he asked me to look at his chart. His birthday being in April I drew out his next Solar return chart. As he had been living abroad in Cambodia for 4 years I could have relocated his SR chart, but I have lately been using the natal position, so set his SR for Melbourne Australia, his birthplace. 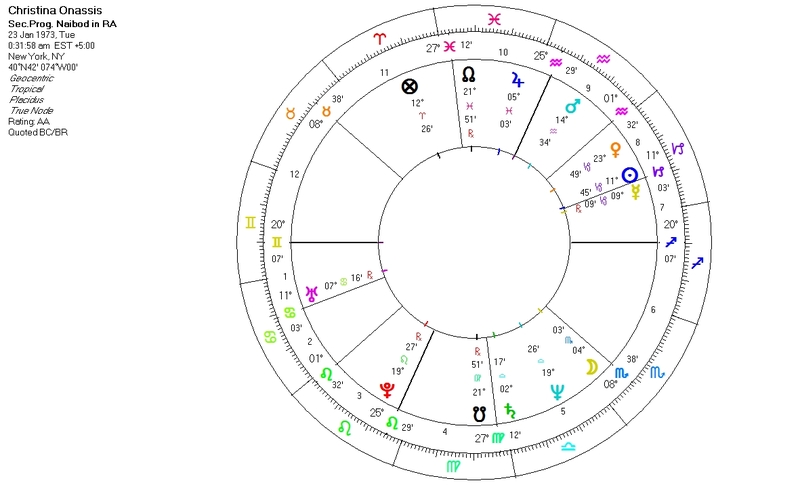 This is his natal chart. He has a Sun exalted in Aries ruling his MC, however the 10th place from the ASC is Virgo, ruled by Mercury. I have often found that writers have Moon in the 3rd house and my son has this placement in the sign of Aquarius. There’s an abundance of Taurus giving him a staying power and the ability to work hard. The Ascendent of the Solar Return was almost at the same degree as his natal ASC, which made this a significant or important year for him. The ruler of that ASC was Jupiter in Taurus on the cusp of the SR 6th house and disposited by Venus. He was turning 29 so he was in a 6th house profected year, with his profected ASC 21 Taurus. As he has Mercury, Mars and Venus in Taurus in his natal chart my first thought was that he would have a busy year. Since the Profected ASC landed on and was ruled by Venus; Venus was a clear “lady of the Year”. She rules the natal 6th and 11th houses and the 1st and 6th house by profection. In the SR chart Venus is cadent in the 6th house in Gemini and conjunct the South Node. The theme of being busy, working hard but getting little recognition or honours during that year becomes more pronounced as the 6th house is emphasized yet again. Especially as Solar Return MC is ruled by a fallen and weak Mercury and Venus is making a partile square to a retrograde Mars in Virgo on the MC, denying any such honours. The Solar Return Moon in Libra conjunct Saturn, reinforces the sense of hard work and also hints at his forthcoming Saturn return which will impact his 11th house of friends and colleagues. My son could not make much sense of such a reading as he had been working as a journalist for 3 years and freelancing for the past year with quite a bit of success. He didn’t understand how being very busy and working hard would not bring him recognition, nor did the idea that events would be initiated by others make much sense, as it was through his own travel and ideas that he had come up with the material for all the articles he had been writing and selling. And how, he asked could the year be “good” if he was going to be so busy but get little recognition? A couple month later, about 1 month before his actual birthday, he received a phone call out of the blue from a reputable publishing company asking him if he would be interested in writing a book on modern day Cambodia. He signed the contract in June (a couple months after his birthday) and will be busy writing for at least 18 months. He will be working really hard with little recognition initially. He is also doing research in a manner that recalls his time at the University. The judgment stands; and my son was duly impressed. In most of the traditional text it is said that when Venus is the Lord of the Year or a time Lord of some sort, she will bring events and circumstances to do with relationships, marriage or women in general. It may yet prove to be the case with my son, though I could not see any emphasis on the 7th house to indicate relationship or marriage (and he is currently not in a relationship). It is interesting that it was a woman who called him asking him to write the book! When I first began to explore the world of traditional astrology I came across a term that was puzzling; antiscia and contrantiscia. The definition was clear enough, degrees of the Zodiac equal distant from the cardinal points of 0 degrees Cancer/Capricorn for antiscia or Aries/Libra for contrantiscia, in other words degrees mirroring each other from the cardinal axis. Planets in antiscia relationship to each other were said to act like a conjunction, while the contrantiscia were like oppositions. In fact the contrantiscia point is in opposition to the antiscia point. For the purpose of this article I will only speak of the antiscia point, its opposition being a given. Now the antiscia was defined as: a shadows point, a reflection or a hidden ally. My intellectual curiosity was pricked. Whilst investigating the antiscia I found that I had two such planetary pairs in my own natal chart. Now the desire to understand antiscia became far more personal. It seemed that the ancients put a lot of significance on these points. Some even mentioned mundane antiscia, meaning degrees of the Zodiac equal distant from the angles; a sort of midpoint. Could these points be activated by transits or progressions? This might explain those times when nothing seems to be happening in a chart and yet the life is filled with dramas and activity. When Pluto transited my Sun, its antiscia point occupied by Venus was also activated. Because my Sun and Moon are in partile square to each other she was also being activated as was her antiscia point occupied by Jupiter. Rather then 1 or 2 planets being shaken by the newly demoted powerbroker Pluto, four planets were involved. All the houses they ruled or had command of were taken along for the ride. Suddenly the potential for what these points could mean became very interesting. 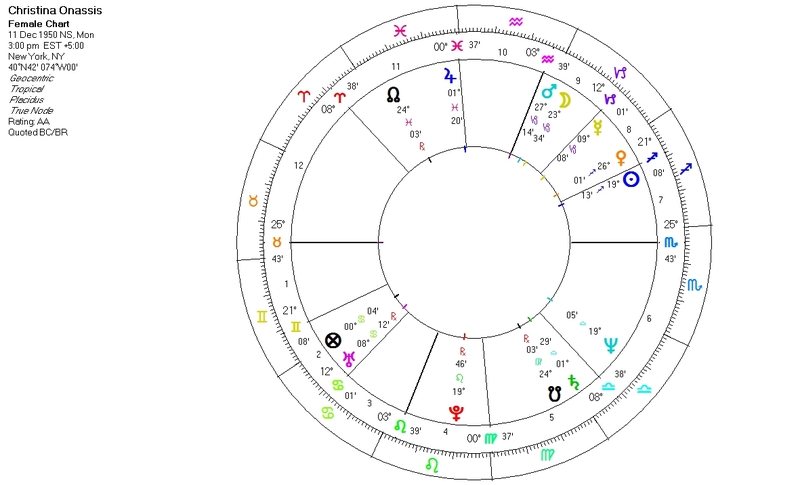 Finding the antiscia point for your ASC and MC can reveal so much about who you are and what you do, especially if there happens to be a planet or other significant point on these zodiacal degrees. As a child I remember reading about Christina Onassis the super rich heir of a fortune. Her life played out in the tabloids as proof that money can not buy happiness. Her life ended prematurely at the age of 37 years and 11 month when she died alone of a heart attack brought on by years of drug abuse and physical neglect. Christina was born into extreme wealth, into a culture and to a father who had little regard for women. Her mother, reputed to be a great beauty was prone to depression. Some accounts claim that she ended her life in suicide; others say she died of natural causes. As a child Christina was close to her older brother, Alexandros, the clear favourite of their father. Growing up they had little contact with either of their parents who bitterly divorced in 1960, when Christina was 10 years of age. She grew into an awkward and conventionally unattractive woman in a world that exalted the beauty of women. By all accounts she was a good business woman who had like her father a natural flair and instinct for business, but she is remembered more for her unfortunate personal life. Within a 24 month period in the early 1970 she lost her entire family when her brother, mother and then father died. She was left alone in the world. Over the years she married four times, but never seemed to find happiness in these relationships. At the age of 35 she gave birth to her only child. She died three years later. Christina’s ASC at 25 Taurus has its antiscia point at 4 Leo, conjunct her IC. The IC represents foundation, family and father; in this case it is ruled by the Sun, a universal symbol of Father. Her identity (ASC) was therefore one and the same as that of her father/family. The Sun also represents the sum total of who we are and who we are evolving into. In her case this was forever bound to her foundations and father, forging her own way in the world would have been that much more difficult. Looking further we see that the Sun is in Sagittarius right on her 8th house cusp. The 8th house is the house of death and also the house of as “other people’s money” or in our modern terms “their resources”. This is the house of inheritance or legacy, particularly through death. The Sun’s placement on this cusp reinforces the antiscian connection between ASC (self) and IC (father/family). It also accounts for the talents and abilities she inherited from her father. The Sun’s own antiscia point is at 10 Capricorn within a degree of Mercury, which rules her 2nd house of money and her 5th house of children & joy. There is little doubt that her money came through her father’s estate and one of the few joyful events in her life was the birth of her only child: Athina. Because of this relationship between Sun and Mercury her health & vitality would be affected by movements to Mercury as well as the Sun. Not only was her Sun connected to Mercury by antiscia and in flowing partile aspect (to the degree) to both Pluto and Neptune, but there was also a hidden contra antiscia (opposition) relationship to Uranus. This gives us a hint of the hidden side of her father. Yes he was powerful and mysterious, but there was a volatile and erratic side that was hidden behind closed doors. It could also symbolize the more self destructive tendencies that hovered just below the surface of her life. Not surprisingly we find that the antiscian degree of her MC is conjunct the DES, the angle of our relationships, traditionally our marriage partner. So who she was in the world was very much defined by who she was in relationship with. Interestingly her DES is ruled by Mars in Capricorn, exalted conjunct and receiving her Capricorn Moon in detriment. 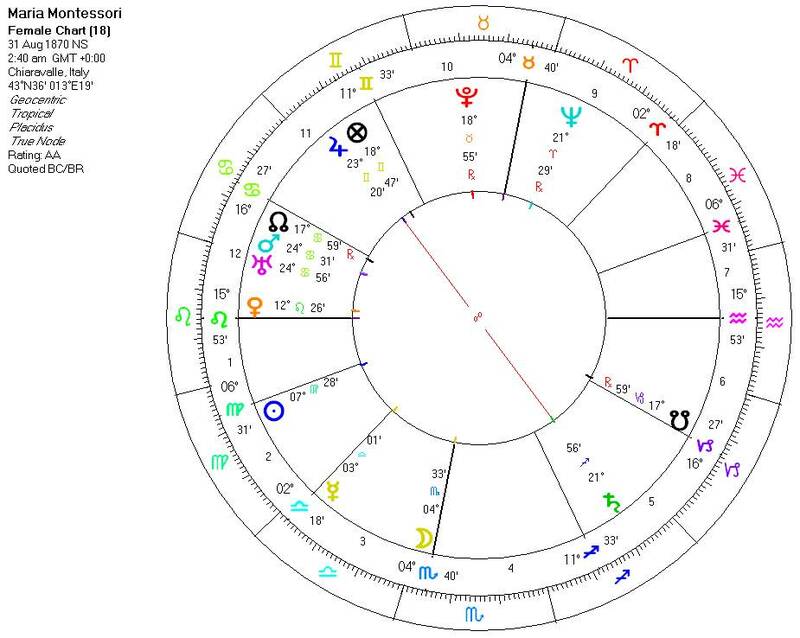 With such an insecure and needy Moon exalting Mars, universal significator of men and ruler of her 7th house, we can surmise that she needed relationships, but as Mars also ruled her 12th house it was potentially the road to her self-undoing. The stage for many a disastrous marriage was set. Through the antiscia connection between her ASC/DES and MC/IC we see how the men in Christina’s life came to absolutely dominate her identity and how she conducted her life. The Sun was not just the ruler of her IC, but also in a secretly ruled her ASC. Mars didn’t just rule her 7th house, but also subverted the reign over her MC. On Jan 23 1973 Christian’s beloved brother was killed in an airplane crash in Athens. On that day her vulnerable Moon at 23 Capricorn was being transited by Jupiter and her progressed Venus, whilst Neptune was on its antiscia point of 6 Sagittarius. This incident fuelled conspiracy theories and suspicion of covert foul play that were never proved. The antiscian Neptune shows us the hidden side of this very public tragedy, which was none the less a very personal loss to Christina. At this time Christina’s progressed Sun had reached the antiscia point of her natal Sun. Her brother’s death projected her further into the world of business as she became the sole inheritor of their father’s business. 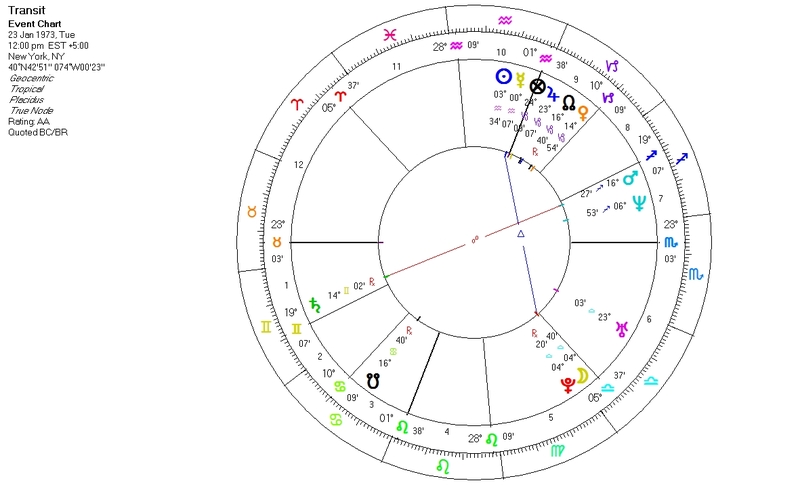 Another interesting antiscian connection at this time was the progressed MC at 26 Aquarius and progressed Moon at 4 Scorpio in antiscia conjunction. This is particularly interesting as the Moon rules her 3rd house of siblings. Behind the very public news about her brother was a devastated progressed Moon in the natal 6th house of “the slings and arrows of outrageous fortune”. Her grief (Moon) was thrown up to public view (MC). This death was the first of many in her family concluding with the death of her father on March 15, 1975. On this day Saturn was at 11 Cancer in opposition to the Sun’s antiscia point of 10 Capricorn and Jupiter was at 29 Pisces transiting the antiscia point of her natal Saturn, ruler of her MC. As well the North Node at 3 Sagittarius right on Mars’s antiscia point. In her progressed chart the Moon had reached the antiscia of her natal Moon whilst the ASC was within one minute of her progressed Uranus’s and 1 degree of her natal Uranus’s antiscia point. This last detail speaks volumes about the final blow her father’s death must have been to Christina, now she was truly alone and abandoned in the world by her family. In her final days Neptune was approaching a transit to her Mercury, which as a result of its connection to her Sun (her vitality) would have affected her health. 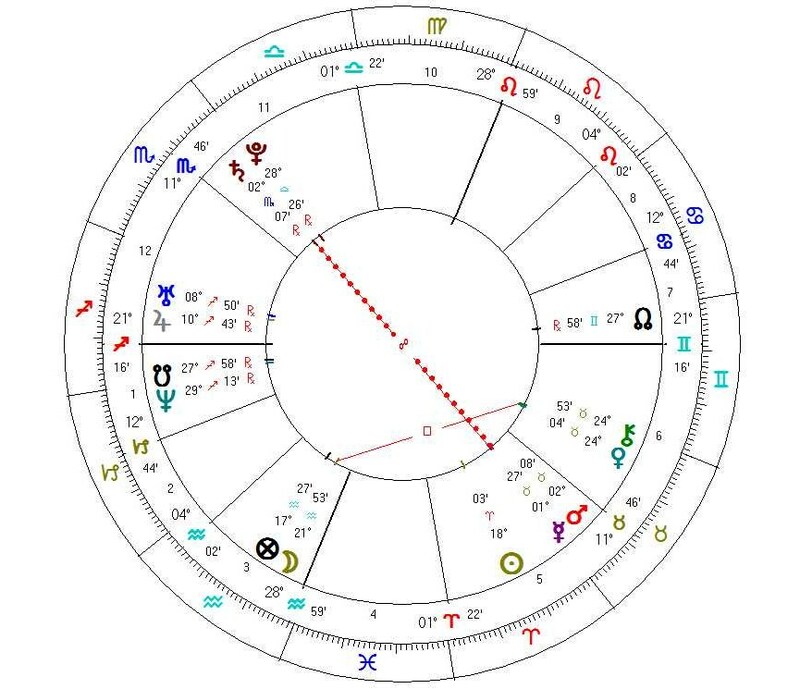 Whilst Jupiter (ruler of her 8th house of death) at 2 Gemini was opposite Mars’s antiscia point, her progressed Sun was conjunct Mars and transiting Mars was opposite natal Saturn (ruler of her 6th house of illness). All in all a very Mars death, though she is said to have died of natural causes she had attempted suicide numerous times during her life and her death was finally brought on by years of drug abuse and physical neglect. There is much more to Christina Onassis chart that could be explored, but limited to looking at the story the antiscia can tell, has given us fascinating insight into a troubled life. According to seventeenth century master astrologer William Lilly, working out the temperament was the first and most important step of natal judgment. In my quest to learn and capture the insights temperaments gave our astrological forefather, I came upon the notion of identifying the significator of manner as a crucial step in understanding how the temperament would manifest in the life. Working with temperaments alone, gives us limited information, but identifying the planet that signifies the “manner” seems to unlock the secret of how an individual basic nature will manifest. The significator of manner was also referred to by other authors as the quality of the soul. The temperament shows us the innate nature of an individual whilst the quality of the soul or manner, show us what they want or choose to become. The significator of manner was identified by William Lilly as either a planet in the 1st house in the same sign as the ASC, a planet conjunct or in partile (to the degree) aspect with Moon or Mercury, ruler of the ASC if aspected by one of his rulers or finally if no planet fits any of the above conditions you would judge the planet with the most essential dignity at the degree of the Moon and Mercury to be the significator of manner, that is the planet through which the temperament is expressed. It is important to note how the planet signifying manner is configured in the chart, what it rules, aspects and its dispositor. The catch was that only Mercury, Venus, Mars, Jupiter and Saturn seemed to be eligible for the role of significator of manner. The luminairies and the outer planets (unknown in Lilly’s time) modify the planet(s) of manner and add much to the story it tells, but can not function alone. That a person’s life work reflects their nature should be a given, after all we can not divorce ourselves from who we are (no matter how hard we may try). Looking at the two educational methods that are Maria Montessori’s and Rudolf Steiner’s legacies we should be able to recognize their founders imprint. In particular will the basic nature of these gifted individuals as defined by their temperament and the planet that signifies their manner, be reflected in their educational method? Maria Montessori developed her method of education through the observation of children rather then by the application of theories. Her medical and academic training allowed her to approach her work in a very structured and intellectual manner. She observed the child’s innate ability and joy in learning and understood it to be a natural result of a child’s interaction with his environment. Many of Montessori’s then radical ideas about children and their education have now become part of the excepted norm. Whilst Maria Montessori focused her entire working life on education, Rudolf Steiner was far more eclectic. He was a visionary and came to his development as an educator through his profound understanding and experience of the spiritual nature of the world and man. His point was to nurture the spiritual development of the child and to allow it to unfold free from adult (and therefore corrupted) interference. Both systems have similarities, in that the respect of the child’s ability to learn is paramount and that the learning environment is child centered and focused. Both maintained that children learn only when treated with respect and in a nurturing environment. Both also contained an element of idealism, believing that through the child the world could be changed. Briefly, the Montessori system emphasizes the prepared and ordered environment in which the child is free to explore, naturally learning through his senses, beginning from the concrete evolving to the abstract. The Montessori system believes that the child’s innate desire to learn will lead him to naturally acquire the skills needed at the point when he is ready. Montessori discourages the exposure to fantasy and fairy tales, believing this to confuse the child and that the “real” world was fascinating enough. The Steiner method on the other hand encourages imagination and believes that the child comes to understand the nature of the world through colour, play and myth. The Steiner method emphasizes the spiritual nature of the child and encourages its expression through movement, storytelling and play. They advocate not exposing children to the academic subject until the age of eight. Maria Montessori was born in Italy in 1870. As a child she showed a great interest and aptitude to study and was encouraged by her mother to pursue an academic career. After many difficulties and restrictions she became the first woman in Italy to qualify as a medical doctor. She later went back to school to study psychology and philosophy. In 1904, she was made a professor of anthropology at the University of Rome. She gave up both her medical and academic career in 1906 to focus on the education of children full time. Until her death in 1952 she traveled the world revolutionising pedagogy. Her personal life was more austere. She had a son, Mario, with a colleague, Dr. Montesano, the couple never married. It was said that Maria and Dr. Montesano agreed to never marry, but eventually Dr. Montesano reneged on his part and married someone else. Mario was raised by a family in the countryside of Rome and his mother would visit every once in a while. Judging her temperamental nature through her natal chart we find a woman whose more external nature (ASC and Sun) were predominantly Choleric, so basically hot and dry, with some Phlegmatic (cold, moist). This means that her natural inclination was to expand and move outwards (hot) and be very structured and defined. There can be a tendency for Choleric people to be dogmatic and stubborn and if biographical reports are to be believed, this was a part of her character. The Phlegmatic quality resided entirely in her Scorpio Moon conjunct her IC (foundations) and ruling her 12th house. Identifying the significator of her manner, the planet through which her nature is focused, we find that Venus is in her 1st house in the ASC sign of Leo in antiscia conjunction to Pluto in the 10th house. Venus is powerfully positioned on her ASC and rules her MC, 3rd house as well as Mercury (conjunct the 3rd cusp). Clearly we see career coupled with early learning and children (Mercury, natural ruler of children, despositor of the 5th house ruler Jupiter and PoF in Gemini). Her choleric nature was most clearly expressed in these realms of life through powerfully placed Sanguine Venus, helping to temper her overly choleric nature. Coupled with the influence of powerbroker Pluto, we can symbolically see the incredible transformation of childhood education that she accomplished. As her the phlegmatic part of her nature resides entirely in her Scorpion Moon and was ruled by Mars in all dignities: domicile, triplicity, term and face. We could judge Mars as a secondary significator of manner. Mars himself is in the phlegmatic sign of Cancer (in mutual reception with her Moon in Scorpio) and conjunct Uranus. Today we may forget how radical some of her ideas on children and education were, as well as how radically she lived her private life. There is idealism in her educational philosophy that can be seen in the partile trine between her 9th house Neptune and 5th house Saturn: idealizing the structure of the environment. Neptune is also squaring her Mars and is in antiscia conjunction with her natal Sun. The relative positions of Venus and Mars in regards to the ASC indicate that Mars came to the forefront later, when by direction the ASC and Mars had conjoined, at about the age of 21/22 when she began to fight to attend medical school. This was a woman who fought for and won everything she achieved in her life, beginning with her conservative father, the authorities at University and later other educationalists. Mars rules her foundation and father (4th house) and higher education (9th house). Privately, her life was not as successful as her career. She had a child out of wedlock (5th ruler Jupiter is in detriment) who was raised by another family and she never married. Her personal fights may have ended in a far more phlegmatic manner then her public ones. Rudolf Steiner was born into a stable working class family. From a very young age Rudolf was aware of things unseen. As a boy he showed such intelligence and eagerness to learn that his father arranged for him to be educated. Steiner studied far more subjects then was required, doing outside reading on subjects as philosophy, psychology, science and geometry. He was inspired by Goethe, who he recognized as one who perceived the spiritual in Nature. Eventually Steiner founded the Anthropophy society (a break away faction of the Theosophical movement with more emphasise on the Western mystical tradition, rather then the eastern bent of the Theosophist). Unlike Montessri he did not dedicate his life to education, but rather to a far more expansive palette of interests, with an overall theme of transforming society through the recognition of the spiritual nature of man. He was extremely prolific, writing some 33 books and delivering over 6000 lectures in his lifetime. His development of the Waldorf school happened later in life at the age of 57 at the instigation of friends. Rudolph Steiner’s chart indicates a Phlegmatic/Melancholic temperament giving him a predominately cold nature (with equal moist and dry). This means that his movement is down and inwards. This is a man who was able to spend much time alone and in contemplation. The moisture in his nature gave him the ability to connect things together whilst the dryness allowed him the ability to put structure to his insights. As no planet was in the 1st house, no planet was in partile aspect or conjunction to either Moon or Mercury (though Neptune conjuncting Mercury will be a modifying influence), the ASC ruler Mars was not aspected by any of his rulers, we are left with Mercury as the planet with the most dignity at the Moon and Mercury degrees as the significator of manner. So his manner was signified by occidental therefore melancholic Mercury, conjunct Neptune in Pisces. The dispositor of both is Jupiter in Leo conjunct this MC. Jupiter is the universal significator of all things philosophical, religious and spiritual. This indicates that his nature was expressed through a dry mind that was able to perceive things unseen (Neptune). He would want or choose to communicate and share these perceptions with the world. Mercury also tells us about the great variety and amount of interest and work he did. Mercury rules the 8th and 11th houses, Moon, Uranus and Saturn giving us further clues as to how and in what areas of life Steiner’s very cold, contemplative nature would be best expressed. The Lunar contact, Moon is in opposition and is received by Mercury, supported by Neptune conjunction, indicates the reflective nature of Steiner’s mind. Through his Moon, ruler of the traditional 9th house of dreams, philosophy and religion, his nature is drawn to the unseen. The Melancholic nature of his Moon (and Mercury) gives him the ability to structure his perception of the spiritual world. His desire to awaken humanity consciousness to the spiritual nature of life is clearly indicated by Mercury’s dominion over the 11th house of community and 8th house of death. After all we need to accept the death of the body before we can understand the life of the Soul. The only heat in the temperament comes from his ASC ruler Mars. It is interesting to note that Pluto is conjunct ASC ruler Mars and is in almost perfect antiscia with MC. This allowed him to bring the energy and power (Mars conjunct Pluto) needed to project his work out to the world as he did. Michael Moore has produced some of the most successful feature film documentaries ever made which have changed the art of documentary film making forever. Editorially he shamelessly presents the world his opinions disregarding the usual pretense of impartiality that is conventionally associated with the reporting of current affair issues. This is a man who has created strong and divided reaction and who continues to express his strongly critical views of western political, social and business morals despite conservative backlash. He appears to do so as a means of awakening the people to the corruption and hypocrisy of the powers that be. Temperamentally, Michael Moore is a predominately dry, choleric/melancholic individual with more heat then cold. This makes him very contained and sure of himself, not easily influenced by others. The heat in his nature propels him out into the world. His natal Sun, ruler of his ascendant, sanguine in nature (a seasonal spring Sun) but in a melancholic sign, positioned on the MC supports this natural inclination. The coldness exists in his Moon that is melancholic by sign and cycle and ruled by a melancholic planet, it is the private, reflective and more intimate part of him that is most able to focus inwardly. The significator of his manner, the planet through which he will most easily express his nature is Mars in Capricorn partile conjunct his Moon and ruling his Mercury. This is the planet of action and is always willing to fight for a cause. Here Mars is in exalted dignity with rulership over Saturn, Mercury, the ninth and fourth houses as well as receiving the Moon into his exaltation. Choleric Mars adds more heat and dryness to his nature. Exalted Mars is in mutual reception with his dispositor Saturn in Scorpio receiving each other into their rulership. Saturn on the IC may bode well for his ability to bring structure and discipline into his life, but it also shows us that at the root of Michael’s character maybe a fundamental fear or sense of lack. This insecurity is amplified by Saturn’s mixed mutual reception with the Moon receiving Saturn into his fall. Saturn befriends the afflicted Moon only to find that she brings him trouble. His detrimented Moon rules his twelfth house and exalts his tenth. Secret enemies may be perceived everywhere out in the world but with Mars on his side he is motivated and able to take action in order to purge the power structures that be of their corruption. Moon/Mars are in partile trine to the Sun and sextile Saturn at the IC. The Sun opposition to Saturn clearly shows us how Moore will expose those at the top by shedding light on the secretive and hypocritical nature of their underground dealings, symbolically illustrated by Saturn low in Scorpio. To help him fight Mars will enlist the help of Mercury in Aries in the ninth house of beliefs and philosophy as well as the house signifying publishing, to get the word out. The tone of his word will reflect the choleric nature of Mercury’s sign placement and the importance of his message can be deduced by Mercury’s position on the bends of the Nodes which are exactly conjunct the sixth/twelfth house cusp, revealing secrets and the disease of society; corruption. Mercury reigns over Jupiter who though in detriment is placed in the house of his joy and like Mercury is in Hayze (being in sect in a diurnal chart, over the horizon and in a diurnal sign) this gives both more ability to be of service to the native. No one could accuse Michael Moore of acting insignificantly and Jupiter is well used in communicating his message on a grand scale. As ruler of his 5th house of creative endeavours it seems appropriate that Moore has chosen the medium of film, entertainment as well as writing to get his message across. Mercury’s reception by Mars ensures that the message comes across forcefully and with absolute conviction. As the ruler of his second house Mercury indicates that Michael’s money will come from the ninth house realm which encompasses inspired thought, beliefs, philosophy, intellectual and spiritual quest as well as the more mundane publishing, foreign affairs and long distance and international communication. Though Mercury is peregrin (having no essential dignity) and cadent he is disposited by the Sun in whose exaltation and triplicity he finds himself. As ruler of his ASC the Sun sits prominently on his MC. Unlike many filmmakers or authors Michael Moore is not a behind-the-scenes man. He does not shy away from the limelight, appearing in his own films, bullishly confronting his targets (Mars is in partile trine). Both Sun and MC are ruled by Venus strongly positioned in the tenth house, in her own sign of Taurus indicating that his career life will be successful and of a creative nature. 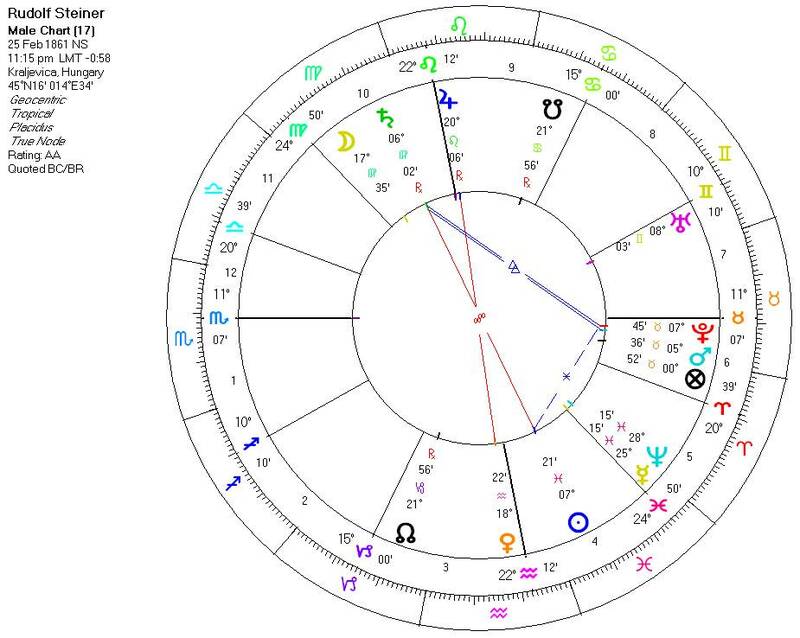 His Prime Motivator (the ASC ruler in the best position to take the lead) is a toss up between his Sun conjunct the MC and Venus in the 10th in Taurus. Though Venus only has authority over the ASC by term she is in better essential condition so most likely to take the lead. His main motivation will be his career and communication as Venus also rules his third house. Sun conjunct the MC shows us the importance of shining and together with Venus who conveniently receives the Sun into her rulership, we can see a brilliant career promised. Venus is within minutes of the antiscia square (6 Leo 20) to Saturn and the MC/IC axis. Jupiter is also within an antiscia trine (6 Cancer 06) to Saturn and IC, adding further motivation for exposing the covert operations of those whose authority underpins society. Positioned in the 3rd house of communication and under Venus’s rule, Neptune contributes his modern association with cinema to the career combination seen in Michael’s chart. Likewise Pluto closely squares Venus from the first house bringing passion and obsession to the professional expression of Venus. The plutonic influence is re-emphasised by Pluto’s close antiscia to the MC. Finally, Uranus is in the 12th house with the South Node, helping to expose the hidden enemies and manure of society. His involvement with the Nodal and Mercury T-square adds an element of the unexpected to his method.